One of my favorite show is starting up in September. The real life Dexter, Michael C. Hall is recovering from cancer and is thrilled to be back for season 5. One of the characters, Vince, (Asian dorky-funny blood splatter side kick) hopes that he doesn't discover Dexter's true Serial Killer background. Why? C.S. 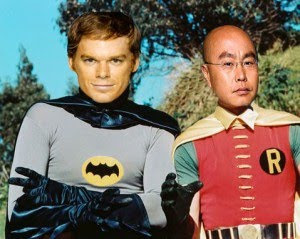 Lee (Vince) doesn't want to be Dexter's victim, which means, he is out of a job. I hope Vince does not get killed off the show. He makes everyone laugh with his quirky-perverted self. 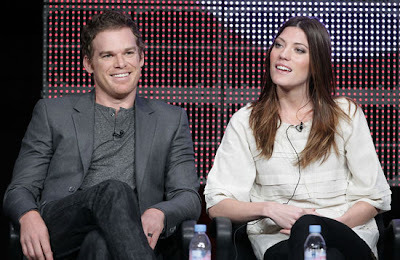 (Pictured is Michael C. Hall and his wife Jennifer Carpenter) Jennifer is also in Dexter, she plays Dexter's sister. Weird huh?